LETTER FROM THE EXECUTIVE DIRECTOR Greengs, Our society is facing challenging mes in meeng the prosocial needs of our youth. The causave aermath is an increase in administraon of disciplinary acons in our school system; especially for young men of color. The counterproducve and cascading eďŹ&#x20AC;ect is widespread and is most associated, but not limited to, underserved students in low socioeconomic communies. This is a naonal struggle and has long term implicaons for tomorrowâ&#x20AC;&#x2122;s work force and societal cultures. According to the latest research from the Gurian Instute: â&#x20AC;˘ Boys receive two-thirds of the Dâ&#x20AC;&#x2122;s and Fâ&#x20AC;&#x2122;s in our schools but less than 40% of the Aâ&#x20AC;&#x2122;s â&#x20AC;˘ Boys are twice as likely as girls to be labeled â&#x20AC;&#x153;emoonally disturbedâ&#x20AC;?. â&#x20AC;˘ Boys are twice as likely to be diagnosed with a behavioral or learning disorder. 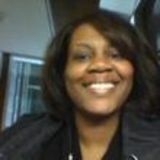 â&#x20AC;˘ Boys are four mes as likely as girls to be suspended or expelled from early childhood and K-12 learning environments. â&#x20AC;˘ Boys are behind girls in most developmental stages, behavioral, academic, and social indicators in all industrialized countries. Currently, in the United States, 1 out of 3 youth lack a trusted role model they can turn to for guidance and advice when needed. Without proper guidance, our youth are at greater risk for lower-academic performance and key candidates for becoming high school dropouts. There are over 9 million youth in the United States facing daily challenges in their homes and neighborhood environments. These formidable situaons may cause youth to engage in potenally destrucve habits; adversely impacng their ability to stay in school and evolve into successful adults. 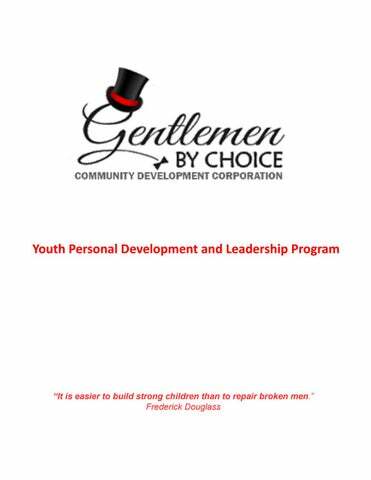 The Gentlemen By Choice Community Development Corporaonâ&#x20AC;&#x2122;s Youth Personal Development and Leadership program serves as a prevenon and intervenon alternave designed to meet youth where they are and provide them basic life skills to support their evoluon into adulthood. Since it incepon in 2014, GBC has sought to serve as a transformaonal experience for young men, the program evolved to now include young ladies. The program focuses on teaching youth basic life skills in the areas of Leadership, Image, Financial Literacy and Eque?e (L.I.F.E) training. Priority is placed on teaching students pro-social skills associated with suc-cess. These skills include: leadership, work ethic, eďŹ&#x20AC;ecve communicaon, self-esteem, posive aBtude, adaptability, crical problem solving and collaboraon to name a few. By supporng the GBC program though volunteering, donaons, and partnership, you are helping change the lives of many children throughout the naon; an eďŹ&#x20AC;ort the will yield a posive trajectory for a be?er America. Today GBC has grown to serve over 500 students in the metropolitan Las Vegas Area; over 200 students in Maui, Hawaii; and over 100 students in Tacoma, Washington. Please join in our diligent eďŹ&#x20AC;orts as we connue our mission in â&#x20AC;&#x153;developing tomorrowâ&#x20AC;&#x2122;s leaders todayâ&#x20AC;?. The concept of ďŹ nancial literacy focuses on teaching students the basic principles of money and praccal ways to manage it responsibly.